"Plane Crash at the Four Corners," Thomas Bouckley Collection, Robert McLaughlin Gallery, 2107 2046, 1918. In Oshawa, as elsewhere, experiences with early aviation could be hazardous, particularly in the first few decades of flight technology. In recent memory, the city’s relationship with airborne transportation has come to be a highly contested site of debate, as runway expansion, noise abatement, and the fear of small plane crashes have all come to bear on the tone of conversations surrounding the skies above, and the ground below, as concerned residents have organized community action groups to protest proposed changes to the Oshawa Airport. This situation was created, in part, by the northward spread of suburbs in the post-World War Two era, and also by an increase in the significance of airport activities to commerce, recreation, and industry, particularly automobile manufacturing, in the past 60 years. Before the construction of the Oshawa Airport during the Second World War, discussions over the virtues of the airplane were far less political, but no less perilous. My current research examines the extent to which a heterogenous transportation matrix in the first few decades of the twentieth century was displaced by the creeping hegemony of the automobile leading up to the 1940s. In looking at multiple forms of mobility, my sources have led me to consider the ways in which early aviation played a part in mapping space in Oshawa, in the sky, but especially on the ground. A number of facets of popular culture tapped into a fascination with the “aeroplane.” They reveal the links between diverse forms of transportation. Early McLaughlin Motor Car advertisements from Oshawa disseminated during the Great War show the layered relationship between various forms of mobility, and more than one of these drew on the high symbolism of flight to market early automobiles, especially in the context of the Great War. In addition to this, newspapers articles from the 1910s and 1920s capture this fascination by documenting the pursuits of local residents and their experiences with early flying machines, announcing nearby landing sites, mostly open fields, with great ceremony, and revealing a deep curiosity over airborne mobility. Image 1: “Plane Crash at the Four Corners,” Thomas Bouckley Collection, Robert McLaughlin Gallery, 2107 2046, 1918. These crashes represented a futuristic novelty, and local residents engaged with the spectacle of falling airplanes with delight, awe, and an appropriate amount of apprehension, fear, and bravery. 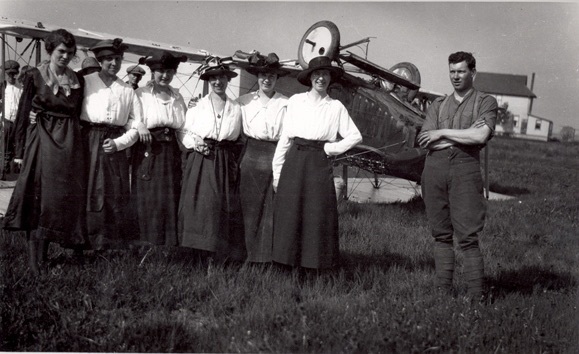 They did this by showing up, watching rescue and salvage efforts, taking pictures, and also collecting souvenirs from the small airplanes that fell from Oshawa’s skies between April and September 1918. In this way, historical photographs from this period reveal the multiple ways in which people interacted with the airplanes that crashed, at least six of them that I have noted during these months, and all within roughly a kilometre of Oshawa’s downtown. 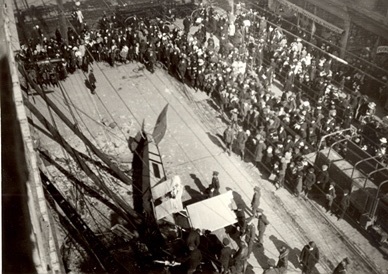 Image 2: Archive Caption: “…a crowd is gathered in the street below to watch the plane being lowered by ropes and slid down long poles to the ground. The west corner of Burns Shoes can be noted at the upper right, as well as the Oshawa Fire Department ladder truck in the upper middle of the photo. Another truck, possibly military or Oshawa Railway is at the right foreground picture edge.” “Salvage Operations After the Plane Crash,” Thomas Bouckley Collection, Robert McLaughlin Gallery, 2128 2067, 1918. Image 3: “Ontario C1324 Down at the Oshawa Golf Links,” Thomas Bouckley Collection, Robert McLaughlin Gallery, 2143 2082, 1918. Which happened around six, on Monday night. Lost all control of his plane and lit on the bank. Which made their appearance as the plane came down. So you could hear all about it as you passed by. But refused any help from the fireman of the town. While soldiers of the town were put on guard. The wrecking gang came from Toronto Tuesday noon. Image 4: “Pilot (?) of Ontario C1324,” Thomas Bouckley Collection, Robert McLaughlin Gallery, 2153, 2092, 1918. 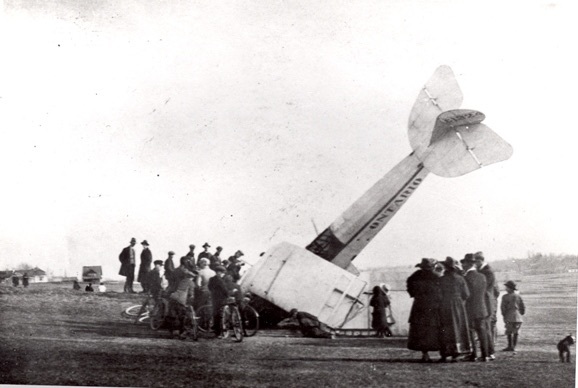 In addition to knocking out power on at least one occasion, and generating fears over the safety of local residents, these crashes clearly drew spectators, and crowds gathered to let their “tongues fly.” Unsurprisingly, the crash of Ontario C1324 elicited this exact reaction, as middle-class children and “groups of men” gathered to “collect pieces of the damaged wing,” and also take pictures of military personnel. In addition to drawing crowds of onlookers, these crashes also provided an opportunity for adventure seekers to pose with the downed planes, and snap photographs of the airmen who fell from the sky (Image 4). In Image 5, reproduced from the Thomas Bouckley Collection, the staff of Miller’s Arcade, a popular downtown entertainment draw, posed in front of C375, which came to rest upside down in Alexandra Park. The pilot, who was far less engaged with the camera than the arcade staff, looks away, lost in thought, or perhaps contemplating his overturned bi-plane. A group of working women stand proudly in front his crash, clearly chuffed to be in such close proximity to this incredible sight. This was in spite of the fact that by September of 1918, airplanes falling from the skies near Oshawa’s downtown were almost commonplace. But in the closing weeks of the summer, frequent crashes, and near misses, persisted in capturing the imagination of residents. With the end of the Great War not far off, it was an eventful year in Oshawa indeed. Image 5: “Miller’s Staff At Overturned Plane,” Thomas Bouckley Collection, Robert McLaughlin Gallery, 2162 2101, 1918. 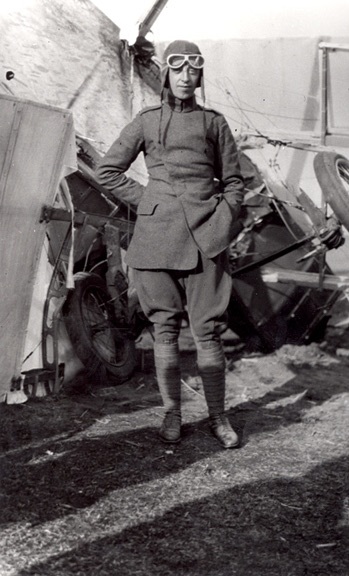 “Plane Crash at Parkwood,” Thomas Bouckley Collection, Robert McLaughlin Gallery, 2156 2095, 1918. 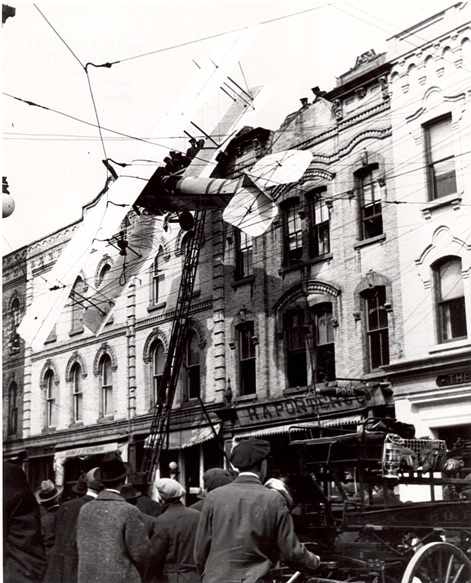 “Plane Crash on King Street West,” Thomas Bouckley Collection, Robert McLaughlin Gallery, 2102 2041, 1918. “Ontario C1324 Salvage Efforts,” Thomas Bouckley Collection, Robert McLaughlin Gallery, 2148 2087, 1918. Ruby Gould, “The Aeroplane Accident,” The Thomas Bouckley Collection, Robert McLaughlin Gallery, 2114 2053, 1918. “Salvage Souvenirs,” The Thomas Bouckley Collection, Robert McLaughlin Gallery, 2151 2090, 1918. “Miller’s Staff at Overturned Plane,” Thomas Bouckley Collection, Robert McLaughlin Gallery, 2162 2101, 1918.